Even though large tracts of Europe & many old & famous States have fallen or may fall into the grip of the Gestapo & all the odious apparatus of Nazi rule, we shall not flag or fail. We shall go on to the end. We shall fight in France, we shall fight on the sea & oceans, we shall fight with growing confidence & growing strength in the air; we shall defend our island, whatever the cost may be. We shall fight on the beaches, we shall fight on the landing-grounds, we shall fight in the fields & in the streets, we shall fight in the hills; we shall never surrender; & even if, which I do not for a moment believe, this island or a large part of it were subjugated & starving, then our Empire beyond the seas, armed & guarded by the British Fleet, would carry on the struggle, until, in God’s good time, the New World, with all its power & might, steps forth to the rescue & liberation of the Old. Germany went to war against France, Russia & Great Britain in August 1914, in a flurry of patriotic fervour. After early successes in France & Russia, the fighting became deadlocked in a mass of trenches on both fronts. Germany went on the defensive in the west for the next three-&-a-half years, only attacking at Verdun in 1916 & the war was going in its favor by the end of 1917. Although the US had entered the war on the Allied side in April 1917, the armies of France & Great Britain were exhausted. Russia had also surrendered in March 1918, under the Treaty of Brest-Litovsk, allowing Germany to move large numbers of troops to the Western Front. Victory was in sight but it had to be accomplished before large numbers of American troops reached France. Ludendorff made three successive attacks on the Western Front in the spring of 1918 but the Allied line held each time; the attacks exhausted Germany’s reserves. The German army fell back across France in the autumn, in the face of relentless Allied attacks. The German people were suffering from food shortages, leading to riots across the country, & Berlin was in a state of revolution by November 1918. After the Kaiser had been forced to abdicate, the new government accepted the Allied armistice terms. Although the guns fell silent across the Western Front on November 11th, 1918, rioting increased across Germany. The Allies were now looking for revenge for the war & it was going to cost the people of Germany dearly. There were troubled times ahead & the nationalists placed the blame for Germany’s problems firmly on the shoulders of the men who had signed the Armistice, the men they called the November Criminals. Hitler’s decision to attack the Soviet Union in June 1941 has generated considerable historical controversy. Among the most controversial “What ifs” concerns the timing of the German Attack. What if the Germans had delayed Barbarossa until after dealing with Great Britain (in 1942 or 1943)? 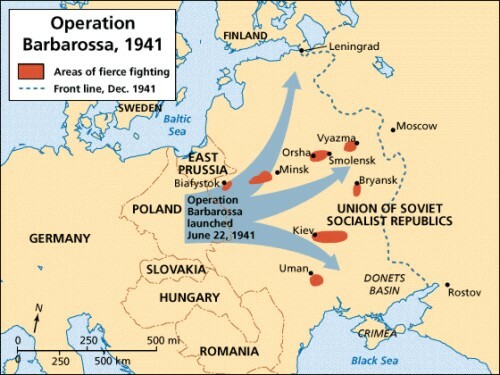 A German delay of up to two years in launching Operation Barbarossa could have had a significant effect on immediate conditions surrounding the attack & on the initial course of operations. It is not likely, however, that such a delay would have altered the outcome of the war. German postponement of Operation Barbarossa until 1942 or 1943 presumes that Germany would have been able to defeat or neutralize Great Britain. Although a direct German invasion of the British Isles was thwarted in 1940 & would probably have been unlikely in 1941, a broad German thrust through the Balkans into the Middle East (an expanded Mediterranean strategy) in time could have brought Britain to its knees. Such an outcome would have cleared Germany’s southern flank & rear & permitted German military planners to adhere to their schedule for an invasion of the Soviet Union in May of 1942 or 1943, thus avoiding the delay which they experienced in 1941. On the other hand, one must recognize that expanded German military operations in the Middle East & Mediterranean basis could conceivably have tied down large German forces, or done damage to German units, which would have required repair by the time Barbarossa actually began: recall German casualties in the Crete operation. Assuming the Germans succeeded in clearing their southern flank, neutralizing Britain & assembling an imposing military host to conduct Barbarossa, the delay of one or two years would have posed other problems for the Germans. First, it is unlikely that the Germans could have achieved in 1942 or 1943 the degree of surprise they achieved in 1941, in particular since they would not have benefited from the deceptive effect which the Balkan operation had on the Soviet government in spring 1941. Second & even more important, by 1942 the Soviet military reorganization & re-equipment program, which had begun in 1940, would have been close to completion, if not fully complete. The Soviet armored force of 29 mechanized corps, so woefully deficient in requisite tanks in June 1941, & so poorly trained & equipped with the 1,443 model T-34 & KV tanks in 1941, surprised the Germans & locally slowed the German attack. By 1942 most of the ten Soviet mechanized corps in the border military districts, & the six which ultimately reinforced them, would have possessed a sizeable compliment of the new tanks, enough to disrupt seriously German operations. The restructuring & re-equipment program began in 1940 after the end of the Soviet-Finnish War, during which the Soviets did so poorly. It involved the streamlining of rifle forces (divisions), creation of mechanized corps, airborne corps, & a host of other measures. 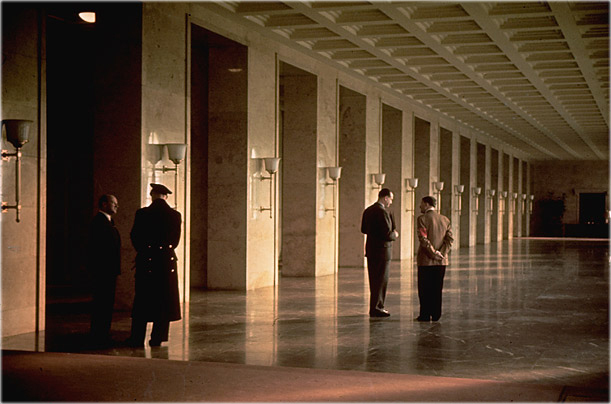 Soviet analysis of German operations in Western Europe spurred the efforts on. According to Soviet sources the program was to be completed by the summer of 1942. By June 1941, T-34 & KV-1 & 2 strength was just short of 1,500, most in the border military districts. By summer, 1942, this figure should have risen to over 16,000. Realistically, the figure should not have exceeded 5,000, but that number would have had a sizable impact on operations. Regarding surprise, 6th Panzer Division’s harrowing experiences with several battalions of Russian T-34 & KV-1 tanks was indicative of what an even larger & better prepared Russian force would have achieved. Had German intelligence detected the existence of the new models, & had Hitler sought to delay the attack until comparable German tanks were available, further delay was a technological race the Germans could not have won. Given greater Soviet military capabilities, it is also more likely that Stalin wold have considered some sort of preemptive action against Germany. If preemption did not occur, Soviet forces would have been better prepared than they were in 1941 to meet & defeat the actual German invasion.